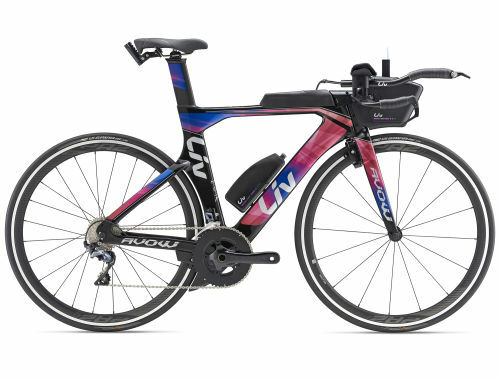 Liv’s 3F Design Philosophy and Purpose Driven Design, along with the Advanced Composite frame technology, create a comfortably tuned tri bike for women. An array of body-positioning options conserve energy in key muscle groups for other tri stages. From the aero frame design to the wheels, fork, and base bar, Avow cheats wind resistance for top speed and performance. This proprietary braking system offers powerful, aerodynamic stopping power. A composite reverse-position front brake and seatstay-mounted rear brake are hidden from the wind. The system also features strategic trailing edges that further improve aerodynamics. Data compiled from Computational Fluid Dynamics research and wind-tunnel tests was used to optimize the shape of every frameset tube and junction for overall system aerodynamics. Liv bikes come in a wide range of sizes to offer the best fit for every woman. Designed using Liv’s 3F Design Philosophy to build bikes for women. Tubing shapes engineered using computational fluid dynamics (CFD) and wind-tunnel data to optimize each tube shape for superior aerodynamic performance.